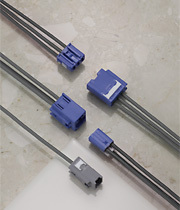 HFCⅢ (High Frequency Connector) series are connectors that connect on-board multimedia devices, such as GPS, TV, VICS and etc., and coaxial wires. These are also suitable for mobile telephone and sensor circuit. -It reduces reflection/transmission loss and restraints noise radiation. It achieved smaller size with higher performance. -Hybrid types for high frequency coaxial wire and automobile wire (AV) are estabished. (It supports diversity receiving system). -Retainer for secondary lock is preloaded and the strucrure allows the high frequency coaxial wire and AV wire to be set by one operation. Therefore improvement of assembling operation can be planned. Note) AV wire = Max. AVSS 0.5mm2 (Terminal is TS 0.64 type).